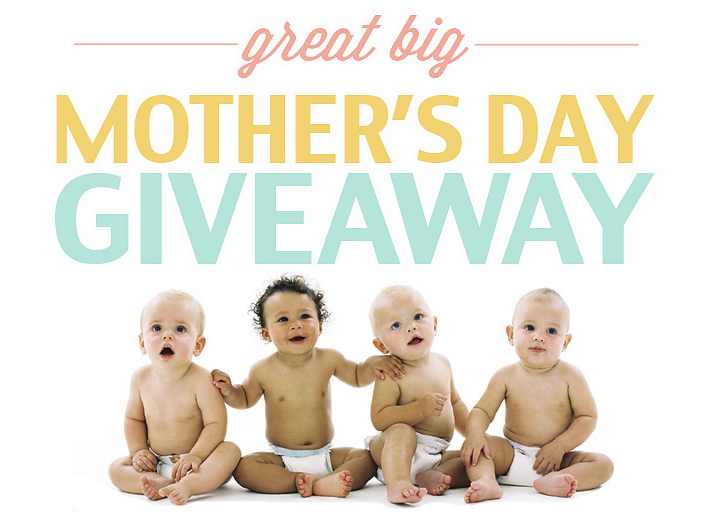 This Mother's Day, I am collaborating with Tollyjoy to host a Mother's Day Giveaway for all my beloved readers who's either expecting a baby soon or is already a mommy *sniffles*. It's not every day you see I host a baby giveaway, this is my first time. I know a lot of my readers are mothers and who has been with me for 6 years since I started blogging. My turn to go through this wonderful journey would be in a few years. I want twins, a baby boy and a baby girl!. This powerful triple-enzyme system is tough on stubborn stains and gentle on fabrics and hands. All new formula for cleaning feeding utensils and also vegetables to allow for healthy eating. Vegetable-based formulation. This laundry detergent will result in a wonderful aroma that allows your baby to smell fresh and good for the rest of the day. Made with mild plant-based ingredients and with anti-bacterial and preservation action. Cleanses delicate skin with mild ingredients and moisturising aloe vera. Comes in Single & Twin Packs. Cleanses delicate skin with mild ingredients and moisturising aloe vera. Comes in both a box or a refill pack. Refill pack sold separately. 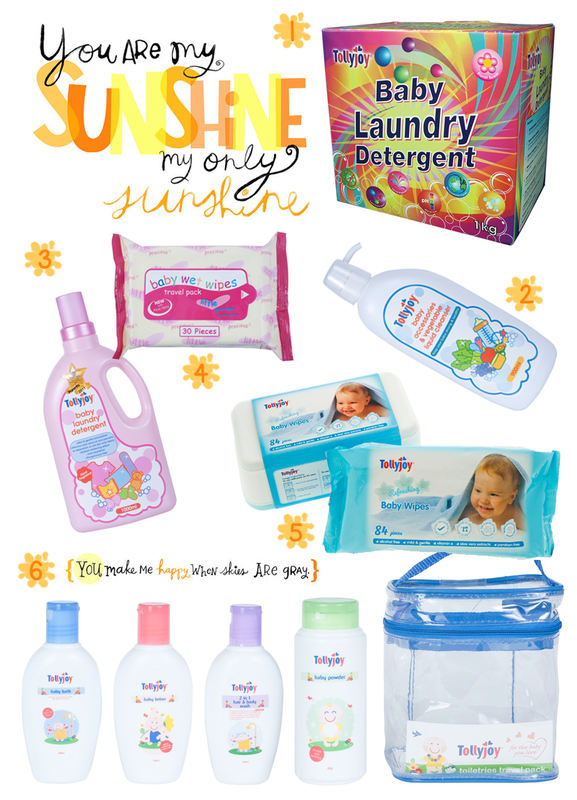 An easy all-in-one travel pack of toiletries for baby during a holiday or a trip back hometown. Comes with baby bath, hair and body wash, lotion and powder. Tollyjoy carries a variety of baby products under their brand which can be found on their cute as a button website. I find the Foetal Development Stages where I can select month 1 to month 9 to find out about my baby's growing stages. The website is packed with information for parents to be under pregnancy guide - pregnancy 101, getting prepared and articles to read. Baby guide on the other hand teaches you how to be a parent in parenthood 101, what baby needs, dealing with baby and also includes a baby playtime guide. At the fun section, you can send our baby e-cards to friends and family, find your baby's name or horoscope and plan for baby's 1st birthday. Founded in 1971 in Singapore, Tollyjoy Baby Products is a company principally involved in the manufacturing and marketing of Baby Care and Mother Care Products under the brands of Tollyjoy and Little Precious. Our tagline 'for the baby you love' expresses our commitment to setting the high bar in the industry with the safety, durability and reliability of our products. By staying on top of global health, safety and manufacturing research trends, we're proud to say that we've been at the industry forefront and have achieved the ISO 9001 in 1996. For the past 4 decades, our mission has been to provide only the best for your baby and yourself. This, we have achieved through stringent quality control across our design, manufacturing and marketing processes. 10 Tollyjoy hampers worth RM100 to be won! Leave a comment with your follower id, name & email address answering two questions about Tollyjoy and a slogan. This giveaway starts from today until 12th May, 2014. Only followers of this blog can join this contest. Hint: Answers can be obtain from www.tollyjoy.com.sg. Question 1: Who is Tollyjoy? Question 2: What is Tollyjoy's tagline? In less than 30 words, share about the special relationship that mummy shares with baby. .......is that you knew he is important to you and nobody can ever take it away. Its like a sunshine after a downpour whenever you sees his smile. sunshine after a downpour, that's beautiful Melissa! Question 1: Tollyjoy is manufacturing and marketing of Baby Care and Mother Care Products under the brands of Tollyjoy. The special relationship that mummy shares with baby of course is where when only me as a mother had the closest bond between baby with me especially during breastfeeding where you can fulfill the mother responsibility to giving the best to the baby. Question 1: Tollyjoy Baby Products is a company principally involved in the manufacturing and marketing of Baby Care and Mother Care Products under the brands of Tollyjoy and Little Precious. The special relationship that mommy shares with baby is the close bonding which started from the womb and the breastfeeding sessions after baby is born. I'm still breastfeeding my 5 year old daughter because she wants breast milk and I love her very much. wow I'm surprised you can still produce milk for that long! Q1. Founded in 1971 Singapore, Tollyjoy Baby Products is a company manufacturing and marketing Baby Care products and Mother Care products. The special relationship that mommy shares with baby is the breastfeeding journey, I know because I breastfeed both my boys. Ans 1: Tollyjoy's is the baby care products that only the best for baby and mum in terms of safety, reliability, comfort, style and practicality. A strong mother relationship starts with consistency, patience, and emotional closeness, which are important for all babies. Answer 1: Founded in 1971 in Singapore, a company principally involved in the manufacturing and marketing of Baby Care and Mother Care Products under the brands of Tollyjoy and Little Precious. We cant sleep without each other. i'll kiss her every nite before sleep and tell her that i love her. aww that's so sweet Ellen! 3) A mother's warm touch, tender love and strong bond with her child are priceless and timeless. Answer 1: Founded in 1971 in Singapore, Tollyjoy is a company principally involved in the manufacturing and marketing of Baby Care and Mother Care Products. Baby is a part of mummy: one body, two heart beats. No relationship could be closer and more wonderful than that..
Special relationship that mommy shares with baby which starts from the baby in mummy tummy, mummy angry or happy, baby can feel it and will give back reaction to mummy. 3. Feeling of baby kicking inside the womb are superb, interaction and relationship with mummy starts even before baby is born! I felt my friend's baby kick in her womb, even as an outsider it feels magical. Question : Who is Tollyjoy? Answer : Founded in 1971 in Singapore, Tollyjoy Baby Products is a company principally involved in the manufacturing and marketing of Baby Care and Mother Care Products under the brands of Tollyjoy and Little Precious. Question : What is Tollyjoy's tagline? Slogan : A miracle and wonder, sweeter than fiction! Answer 1: Founded in 1971 in Singapore, Tollyjoy Baby Products is a company principally involved in the manufacturing and marketing of Baby Care and Mother Care Products under the brands of Tollyjoy and Little Precious. Question 2 : What is Tollyjoy's tagline? the special relationship between mummy and baby is the maternal bond. inside the womb, they share love, food, protection and tenderness. once the sun is set, its breastfeeding! Question 1 : Who is Tollyjoy? Question 2:What is Tollyjoy's tagline? 1. Tollyjoy are baby care and mother care specialist providing only the best accessories and disposables for baby and yourself. The special relationship that mommy shares with baby is always with baby even now baby become young man/girl. In mommy heart, baby always young & small & needs to take care. Tollyjoy Baby Products is a company principally involved in the manufacturing and marketing of Baby Care and Mother Care Products under the brands of Tollyjoy and Little Precious. The bond between parent and child is one of the strongest connections in nature. Romances come and go, but once you've bonded with your baby you're probably hooked for life. thank you for joining this giveaway Junaidah! Answer 1: Tollyjoy are a brand name for baby care and mother care specialist providing only the best accessories and disposables for baby and yourself. Answer 2: "for the baby you love"
The most special realtionship between mummy and baby are during breastfeeding time as the mummy only produce milk to fulfill her young one needs while creating a great bonding moment. thank you for joining this giveaway Jovinia :) ! Answer for Question 1: Who is Tollyjoy? Answer for Question 2: What is Tollyjoy's tagline? Tollyjoy is a baby care and mother care specialist providing only the best accessories and disposables for baby and yourself. A baby is the most precious gift to a mom as it brings out the best in her...loving mother, wise teacher, true friend, knowledgeable guide and a compassionate human being. The baby care and mother care specialist providing only the best accessories and disposables for baby and yourself. 9 months bonded through food aversion, food cravings, blood, sweat and tears. Lifetime bonded through smiles, laughter, tears and endless love-hate relationship during discipline, tantrums and trials. Hey Joyce, long time no hear! Hope you and baby are well! Connect from womb :) thank you Mrs Shyza for participating in my giveaway! Tollyjoy is manufacturing and marketing of Baby Care and Mother Care Products under the brands of Tollyjoy. It will always be one of the strongest love that's unconditional, unselfish and knows no end. A mother’s love for her children is so sacred. Thank you Min Min for joining my giveaway! Q1:Tollyjoy is a baby care and mother care specialist providing only the best accessories and disposables for baby and yourself. Mommy knows the baby’s need immediately even when we are apart or with our eyes close. Love is the bonding agent! * i'm not expecting and my kids are big already, but this is for my little sister who is expecting her second child in July (the eldest is just 10 mths). May Tollyjoy brings her happiness as much as holding the newborn in her arms! Ah :) that's a lovely gesture for your lil' sister who's expecting! Q2: What is Tollyjoy's tagline? My babies are my everything, for me there is nothing more precious or treasured than their love and the bond we share. Thank you Sharon for joining my giveaway <3 I can see they are your everything! "For the baby you love"
Mum's love for their babies is endless~ No matter how painful the delivery process is, the protection and love given to their babies will never be anything less. 1. Tollyjoy is a baby care and mother care specialist providing only the best accessories and disposables for baby and yourself. 1. Founded in 1971 in Singapore, Tollyjoy Baby Products is a company principally involved in the manufacturing and marketing of Baby Care and Mother Care Products under the brands of Tollyjoy and Little Precious. 2. Tollyjoy's tagline is 'for the baby you love'. 3. The special relationship that mummy shares with baby is being able to feel my baby's movement & hear their heartbeat in my tummy. A close bond starts from there till they are born & grow up. Question 2: Tollyjoy's tagline is 'for the baby you love'. Question 3: The special relationship that mummy shares with her baby is the miracle of 2 hearts that beats as 1 for eternity. nice quote :) Thank you Mrs. Yong for participating in this giveaway.